Rough hands? Cracks 'round your nails? So not cool. 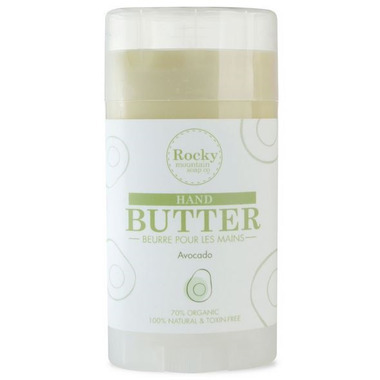 Rocky Mountain Soap Co.'s rich avocado, beeswax, and coconut oil Hand Butter is exactly what you need. Seal em' up, no more pain. Nothing but softness. 100% Natural, Toxin Free and 70% OrganicIt's Rocky Mountain Soap Co.'s same great hand butter, but re-defined for men. No more cracks or dryness. Soft hands, happy partner, end of story. I use it on lips. So wonderful! It doesn't work on hands. Too greasy and the product doesn't moisturise enough long. I love this product! Not only does it smell amazing, but it rubs in quickly and really moisturizes the skin. And the fact that it's a solid stick means it has easy application and is great for traveling.